Summer has arrived, and with it, days at the beach and pool, a lot of outdoor activities and above all, plenty of sun! The sun has many beneficial properties for both our body and our mind, and summer is a great time to take advantage of them. Did you know that exposing yourself to the sun as little as 5 to 10 minutes daily, can strengthen your bones and your teeth, as the UV rays help produce vitamin D? It also helps to stimulate the immune system. And as if this wouldn’t already be enough, soaking in sunlight also helps you be in a good mood, making it easier to focus on the positive side of life and even improve depression. And of course, lets’ not forget that being tanned boosts our self-esteem! Too much sun, however, can be aggressive on our skin and can lead to serious damages. If we do not take the appropriate measures such as using sunscreen and a restorative hydration afterward, we can suffer from serious sequels such as sunburns, premature aging of the skin and even cancer. That is why it is essential not only to protect your skin before and during, but also after sunbathing, always applying high-quality products. Today at APoEM we would like to present you our best products so that this summer you will not only have an amazing smile on your face, but also radiant and healthy skin. The perfect remedy to restore the balance and harmony of your skin. This gel is composed only of natural active ingredients such as witch hazel, chamomile, calendula and aloe that will restore your skin and leave it calmed. In addition, the essences of mandarin and mint with antioxidant, anti-inflammatory, anti-erythematous and antipruritic effects will also relax your mind. Ideal to use as an aftersun, since it recomposes the skin with all the essentials to recover after a day at the beach, minus the toxins that are usually found in other products with similar characteristics. This oil is extremely nutritious, ideal for skins that need extra hydration after spending the day under the sun at the pool or the beach. This body oil is composed of natural coconut, rice, avocado, safflower, hemp and jojoba oils, with essences of incense and wood. It will leave your skin nourished, soft and radiant and is ideal even for the most demanding skins. A fresh and nourishing cream that absorbs quickly and will give you an intensive treatment, ideal for all skin types. With a hint of lemongrass, this cream is perfect for summer days, providing a touch of sensuality. It also has antiseptic, soothing and healing properties. This cream is composed of argan, rosehip, sesame, soy, and mint and has highly nutritious, refreshing and purifying properties that will leave your skin renewed. An elixir in the form of a serum that leaves your skin hydrated and refreshed at any time of the day. Its combination of essential oils of bergamot and chamomile conveys a sense of relaxation and happiness. The natural extracts in this unique formula such as wheat, aloe, Centella mimosa and spirulina will wake your natural protection and hydration mechanisms, with a visible result in both short and long-term, stimulating the skin’s metabolism. It has a high antioxidant capacity and free radical scavenger. A very nourishing cream, ideal to restore dry or sensitive skin that has been exposed to extreme weather conditions. With essences of black pepper, chamomile, bergamot and composed of rosehip, sesame, argan, tomato, wheat, ginkgo, and cranberry. This natural cream will leave your face smooth, hydrated, balanced and with a feeling of pure well-being. With natural extracts of rose, hazel, chamomile, and calendula that transmit freshness, hydration, and tones your skin wherever you are, as it is ideal to carry in your bag and apply whenever you need it the most. There is no doubt that the sun is good for both our body and mental well-being, as long as we take caution and use reliable products that do not include any chemicals or toxins that will end up damaging our body over time. 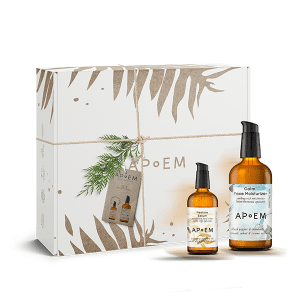 Using APoEM products you can rest assured that you will use only high-quality cosmetics, natural, vegan and in total harmony with nature. We wish you a happy summer!